Class 4 white water rafting also called Grade 4 white water rafting is a rafting, kayaking term which pertains to the hazards and risk of a branch of the white water being rafted. Whitewater rafting has a clear grading system that goes between 1 and 6 where 1 is flat and 6 is unviable, impassible, think Angel falls. 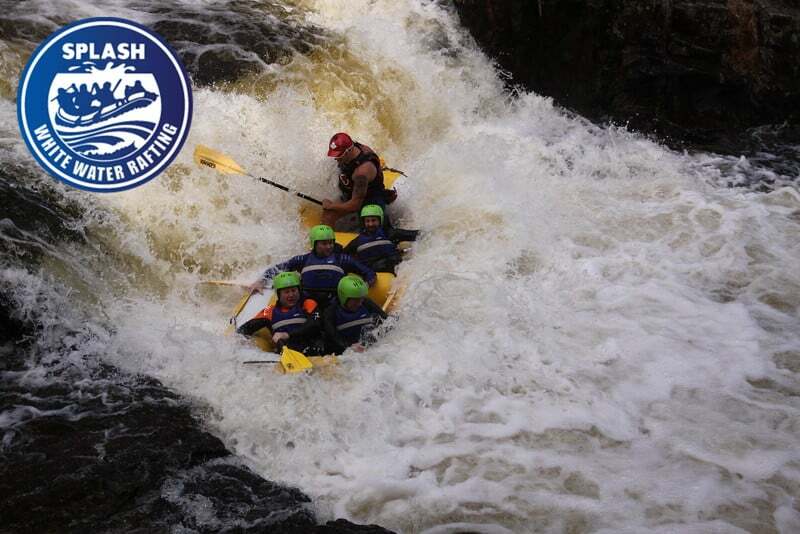 Class four whitewater rafting is defined by having many of these characteristics: Precise manoeuvring required, difficult rapids, high irregular waves, dangerous features, large falls, steep gradient. Class 4 whitewater rafting is at the upper limits of what can be experienced commercially, only outdone by Grade 5 rapids! This classification of rapid provides a massive adrenaline rush, the ultimate rafting experience. However be very aware of the potential dangers as well. Here at Splash White Water Rafting Scotland, we raft many grade 4 rapids. The River Orchy is probably Scotland’s best whitewater rafting river and offers many class 4 rapids, as well as lots of class 3. The River Tummel near Pitlochry Perthshire has one massive class 4 rapid, which is a twin-tier waterfall eighteen foot in vertical height. If you are looking for the ultimate rafting experience check out our River Tummel page and book today.